“Night of Nights XVIII” – radio’s answer to “Night of the Living Dead” – will again unfold on July 12 (July 13 UTC) with the return of maritime Morse code transmissions that were thought to have died in 1999, but now haunt the shortwave and medium wave bands one night a year. The announced 2017 lineup brings both good and bad news, with venerable Coast Guard station NMN joining the active list while ship-to-shore heavyweight WLO stays on the sidelines. For CW aficionados, the event offers not only an audio nostalgia trip, but a chance to obtain QSL cards and – for those in the San Francisco area – witness the event in person at the former KPH facility, located at Point Reyes National Seashore near San Francisco. Amateur radio operators can get in on the fun by working the Maritime Radio Historical Society club station, K6KPH (via CW, of course) – and even operating it if they’re close enough to visit. The event organizers endorse amateur radio licenses with special stamps and “the Great MRHS Seal,” says Chief Operator Richard Dillman. “Night of Nights” takes place annually on July 12 to mark the date in 1999 when commercial Morse code operations ceased in the United States. The six participating stations will take to the airwaves on multiple frequencies at 8:01 p.m. Eastern time on July 12 (0001 UTC July 13) and continue for several hours. 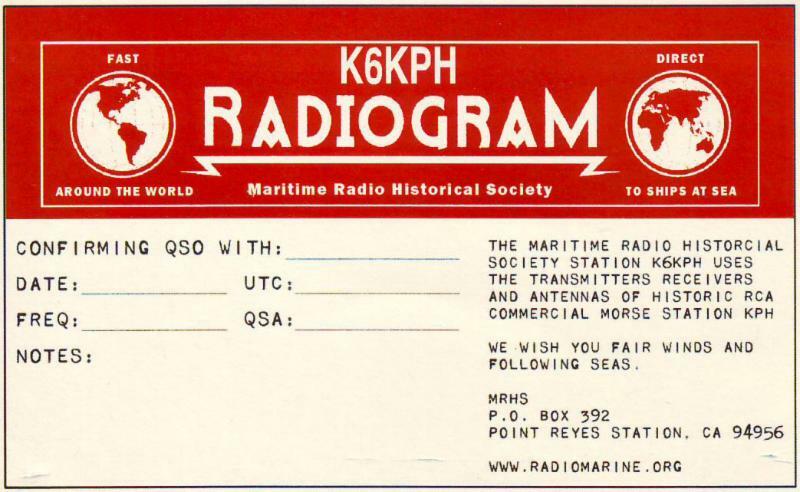 Two MRHS stations, KPH and KFS, will beam signals from the original KPH transmitter site in nearby Bolinas, California, with a quartet of Coast Guard stations checking in from both coasts – NMC (California), NMN (Virginia), NMQ (California) and NMW (Oregon). The latter two will operate on medium wave frequencies only. QSL requests to all stations should include an SASE – but no “green stamps” (dollar bills). This entry was posted in Ham Radio, News, Shortwave Radio and tagged Brian Smith, KLB, Maritime Radio, Maritime Radio Historical Society of America, MRHS, Night of Nights, NMC, USCG, WLO on July 9, 2017 by Thomas. Update: Please read Brian’s update regarding frequencies. “Thought I’d forward you this information on the annual “Night of Nights” event on July 12 (U.S. local time)/July 13 UTC, which provides an opportunity for shortwave QSLs – assuming the listener understands Morse code! I’m sure you’re familiar with this one-night-a-year happening, in which maritime radio stations rise from the dead and transmit Morse code messages again for a few hours. It’s that time of year again. Time to honor all those ops who came before us by preserving their skills, traditions and culture through on the air operations. Why 12 July? Long time True Believers know the story. But it may be worth repeating for new arrivals and to remind everyone of the traditions we hope to keep alive. On 12 July 1999 some very tough looking grizzled old radio pioneers had tears in their eyes as the last commercial Morse code radiogram was sent. It was the end of an era. And as the last beeps faded away into the static they witnessed the end of the career to which they had devoted their lives. These men – and some women – had stood watch over the airwaves on shore and at sea. Theirs was mostly the business of maritime commerce. But when their ship was in peril they were called upon to send the most electrifying three letters in radio, S O S, knowing that all their fellow radio operators would press their earphones close to get every scrap of information and bring aid to their stricken ship. Once, our coasts were dotted with great Morse code radio stations, all communicating with ships at sea. They’re all gone now… all except one, the one they called the Wireless Giant of the Pacific, located at Point Reyes. On that sad day in 1999 another event took place. The Maritime Radio Historical Society (MRHS) was formed. We made it our life’s work to honor the men and women of wireless by restoring that wireless giant. One year and one minute later the giant’s voice once again spanned the oceas as we picked up the thread and kept the faith with our colleagues of the air. 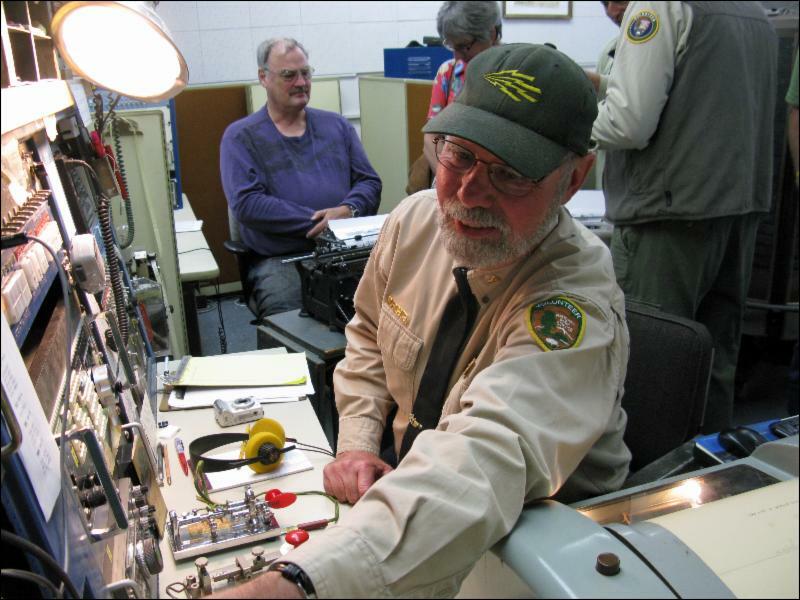 Every year since, in an event that became known as the Night of Nights, Morse code station KPH has returned to the air, joined by KFS and the station of the MRHS, KSM. 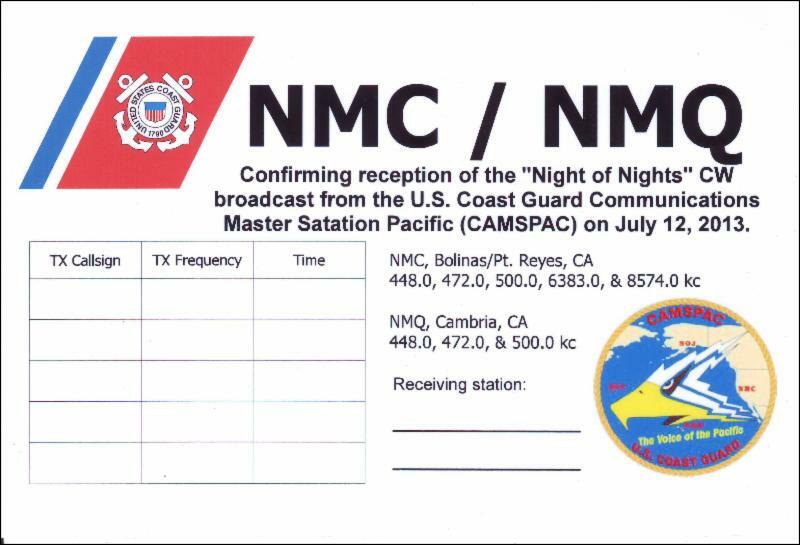 This year our friends and colleagues at USCG station NMC have labored mightily to bring that storied call sign back to life on Morse code for the evening along with NMQ in Cambria, CA..
And station NMW in Astoria, OR will be on the air as well. Stations WLO and KLB will join us again as hey have in years past. This is a global and local event. Hundreds of listeners around the world will be waiting with their earphones on, waiting for the signals of the great station to once again arc over the dome of the Earth to their receivers. You can be with us in person! The frequencies for this event are numerous! I have listed the USCG (NMC) frequencies below, but please check the MHRS newsletter for MRHS and other maritime station frequencies. Again, Brian, thanks for the heads-up! This entry was posted in Ham Radio, News, Radio History, Shortwave Radio, What's On Shortwave and tagged Brian Smith, KLB, Maritime Radio, Maritime Radio Historical Society of America, MRHS, Night of Nights, NMC, USCG, WLO on July 11, 2016 by Thomas. 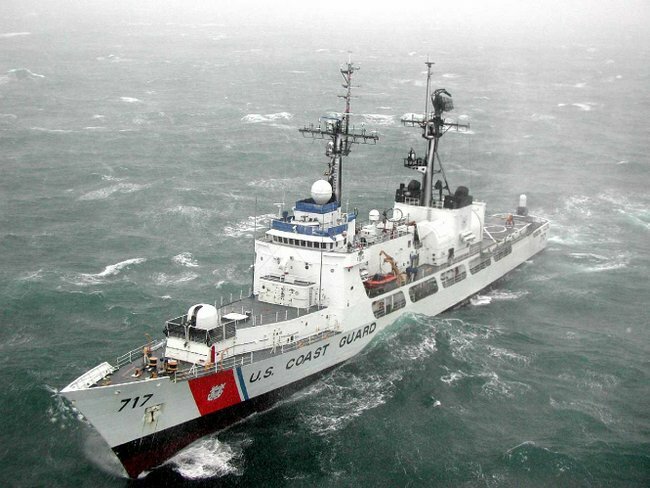 This may very well be the last time ever that USCG stations can be heard on the air using A1A (Morse) emission. As new equipment is installed the hardware and wiring for Morse has been progressively removed. And the personnel who knowledgeable in the art retire or are reassigned. So be sure to listen for these stations. I’ll not only listen to this Night of Nights, but hope to record some of the stations as well. This entry was posted in Current Events, News, Nostalgia, Shortwave Radio, What's On Shortwave and tagged Brian Smith, KLB, Maritime Radio, Maritime Radio Historical Society of America, MRHS, Night of Nights, NMC, USCG, WLO on July 9, 2015 by Thomas.